Nathan Vowels and his employee Blake Bunney were down at the depot early today, pressure washing the Bennett car. Amazing what a bit of scrubbing can do. Blake did a thorough job and was still at it later in the day. We thank Nathan for his interest in helping us out. Next, Jim West will work with Frank Bennett to get the car painted. It would be great to eventually put up an interpretive sign telling more about Bennett Lumber and its distinctive blue rail cars, which ran over the WI&M line for a number of years. Bennett Lumber is a strong part of rail history in the area. Speaking of trains, while we were checking the progress on the pressure washing, the W&I engine came along with a string of 15 empty cars. Were they destined for storage or is Bennett Lumber shipping out another longer train of lumber? Don Somers and Jack Coyner have been slaving away, weed whacking and getting the depot ready for the Speeder Event on July 12. Yesterday the guys took a break to show some Seattle train buffs around. 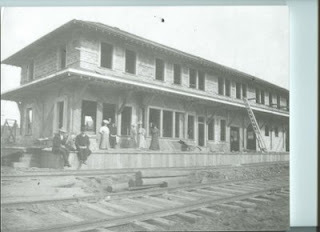 The men were aware of the depot restoration thanks to Ken Vogel's bragging. Additionally, Stan Patterson called to say some Midwest speeders had been interested in the WIM and the depot, although the group's trip from Pullman to Marshall was so long, it was questionable the speeders would get down to Potlatch this time. The depot is looking good and flowers have been planted in the planters around the loading dock. Thanks to Theresa Greiner at Fiddler's Ridge Farm for donations of flowers. Theresa is a big backer of the depot! The construction picture above, compliments of the Potlatch Historical Society. The depot was built in 1906, and thanks to a dedicated group, the old building is gaining a new life! A Bountiful Grain and Craig Mountain Railroad engine pulls a variety of cars along the downriver run from Orofino to Lewiston. The same weak economy that's reducing the number of cars running on two rail lines in north central Idaho and southeastern Washington is providing an opportunity that makes it possible to keep the marginal routes operating. The operators of the tracks connecting Lewiston with Kooskia and Cottonwood and those that link Moscow and Princeton with Spokane are storing cars to make ends meet. Housing starts and consumer spending have fallen so much that big carriers such as Union Pacific are willing to pay for a place to let their cars be idle. "It's either that or the whole railway (between Spalding and Cottonwood) going away," says Karl Nelson, general manager of the Bountiful Grain and Craig Mountain Railroad in north central Idaho. "We're doing everything we can to keep the railroad here." The weak demand for retail goods is helping in another way. Nelson is able to allow customers to keep cars available for orders they receive at the last minute, reducing delivery times. Normally it's difficult to convince big carriers to send their cars to north central Idaho since it's the end of the line. All of the tracks serving the region dead-end in north central Idaho without crossing the mountainous terrain along the Montana border. The Bountiful Grain and Craig Mountain Railroad had faced charges of 75 cents per hour per car once its cars left the lines of major carriers in eastern Washington. Previously, Nelson passed those fees on to customers when they took longer than 48 hours to load cars. The Washington and Idaho Railway, headquartered in Marshall, Wash., saw business decline last year when wheat hit $10 a bushel, said Stan Patterson, president of the line. His partner is Mike Williams, the owner of the Bountiful Grain and Craig Mountain Railroad. In 2007, some growers didn't care that, in some instances, it cost a few cents a bushel less from some places on the Palouse to send their harvest to Portland by train instead of trucking it to the Snake River to be barged, Patterson says. "Just hauling freight is a money-losing operation." The problem doesn't extend to the line that runs from Lewiston to eastern Washington where it connects with large carriers. Potlatch Corp. in Lewiston provides the bulk of the business on that line, which is owned by Watco. Watco is storing some cars on that line because it has space, but it is not dependent on the income to make the line viable, says Mark Blazer, vice president of strategic planning and business development for the Helena, Mont.-based rail company. The situation is the most dire on the lines between Cottonwood, where regular service has been suspended since 2000 after the federal Surface Transportation Board allowed the line to be abandoned. The Bountiful Grain and Craig Mountain Railroad is still paying taxes, insurance and maintenance for the route even though it has no income, Nelson says. That abandonment holds so no additional due process would be required to scrap it, Nelson says. "If we wanted to go in tomorrow and tear the whole line out, it would be gone." But Nelson and his superiors hope to avoid that. The line is in good enough shape that trains could be running on the tracks today if there was something to ship, Nelson says. He would like to get enough grain farmers to agree to ship that he could get Burlington Northern to send one of its 110 car unit trains for grain. That business would supplement the 25 to 30 cars per week the Bountiful Grain and Craig Mountain Railroad hauls off the Clearwater River section of the line where the primary customers are sawmills, such as Bennett Forest Industries, which brings lumber from Grangeville, and Three Rivers Timber in Kamiah. Such ideas seem to be a long shot. Nelson would have to solicit the business and possibly find a way to construct the circular depot the trains require to have fast loading, a project that would likely cost in the hundreds of thousands of dollars. Increasing diesel prices could work in Nelson's favor. Patterson's territory is drifting southward. He's gaining customers who weren't interested as recently as last year. Six months ago it cost 7 cents more to ship wheat by train to Portland from just north of Pullman than if it went by barge. Now it's even and an elevator there is ordering cars for harvest. The biggest share of his business continues to be on the northern part of the Palouse. Co-Ag in Rosalia is his largest customer. "We're optimistic things are going to be good this fall," Patterson says. "...The fuel price being what it is, no one wants to go to the river." Patterson has good reason to be hopeful, says Ken Casavant, a Washington State University agricultural economist who specializes in transportation issues. Trains are 10 times more energy efficient than trucks that get about five miles per gallon and diesel is approaching $5 per gallon, Casavant says. But while some smaller trucking firms are struggling, business isn't immediately shifting to rail for a variety of reasons such as long-term agreements that may be in place for transporting freight. "Right now the issue is 'Will our short lines survive until that time?' " Casavant says. The other variable that Patterson faces on the Washington side of his operation is the state's ownership of the track, which took affect about a year ago. Initially it was a setback because Burlington Northern increased rates, Patterson says. The cost of getting a grain car from the Palouse to Portland went from about $1,275 to $1,475. But in the long term, Patterson expects it will help, noting the state's plans to refurbish pieces of track where the speed limit has been reduced to 10 mph. "The state has track money and they're investing in the infrastructure and they're doing a good job." Don Somers thought it might be a first for the WI&M --concrete ties instead of wood. As Don and Jack Coyner headed to Farmington today to look at the caboose, they went via Palouse. The town is doing a street improvement project where the railroad passes by, and as part of the improvement, a concrete bed is being put down on Whitman Street. Don has supplied some photos to show the changes. As for the caboose, Doug Wasankari went along to Gene and Connie Rambo's to see what strategy he might use to get the car moved. It is quite possible that the caboose might be here in time for speeders on July 12. This is a genuine WI&M caboose so it belongs with the depot! Gene Rambo wheeled into town early yesterday with a load of "seasoned" trucks, signaling that the arrival of the WI&M caboose is at hand. Gene and Connie have owned the historic caboose for years, with Connie and her mom, Alma Hay, and other family members using it as a ceramics workshop. "We've had loads and loads of fun in that caboose," said Connie of the old-timer that had once plied the WI&M line. As the caboose weathered and family members gave up ceramics, Gene wondered about the caboose's future. He'd put a tin roof on part of it to keep weather out, but through the years, the little car has shown decline. Thanks to Gene and Connie's generosity, however, the caboose will take up new digs in front of the depot in Potlatch. In time, the WIMHPG hopes to repair and restore the caboose and put it to use. As for the delivery of the heavy trucks yesterday, the HPG thanks Gene for transporting them to Potlatch, and Jim Larson for unloading them with his self-loader. Jim did a precision job of placing them on the tracks, and also placing a track section further down from the depot. Jim and Gene both show that the HPG depends on the generosity of others to keep moving ahead with preserving WI&M Railway history! Pictured in the photos are Gene Rambo, Don Somers and Jack in front of the rusty trucks before they were unloaded, and Jim Larson doing the heavy lifting to get the trucks unloaded. A big thank you to Caryn Brown of US Bank! She has created a catchy train-themed quilt with companion wall hanging as part of US Bank's commitment to having its employees active in various community projects. The quilt and wall hanging will be raffled off in a drawing during Potlatch Days July 19 and all proceeds from the raffle will benefit the Depot. Tickets are on sale at the Potlatch branch of US Bank and will also be available during the speeder weekend July 13. The quilt is on display at the bank and tickets are $1 apiece or 6 for $5. Don't be bashful about snapping up your tickets soon. The goal for the employees is $1000! Let's help them get there by supporting this project. Kenny Cada, long a Depot supporter (her in-laws Joe and Dorothy Cada spent their early married life as tenants in the Depot apartments), dreamed up the volunteer activity. As branch manager at Potlatch, she was aware that the US Bank CEO was making 8 hours of paid volunteer time per year available to each employee to work on a community project of the employee's choice. Caryn, an avid quilter, said yes to the quilt idea and fellow employee Carol Cooley found the train fabric. Caryn put the custom look together, spending way more than the 8 hours of allotted volunteer time. Other bank employees will help put up displays for History Day at the Depot. We thank our friends at US Bank for their commitment to the Depot. They have been solid supporters!